Well one can argue real robots are the best kind and then someone else could say fictional robots are the best kind and then it could go back and forth all day long but I think what's most important is the source for the reason for our love of robotic characters. my long list had six, my final list had three. I have one real robot, and two faux robots that were in live shows. The rest are fictional. All fictional for me. Science has yet to come up with a robot that matches the high expectations science fiction has established for me. HAL 9000 is a computer that appears in the book and the film "2001: A Space Odyssey". 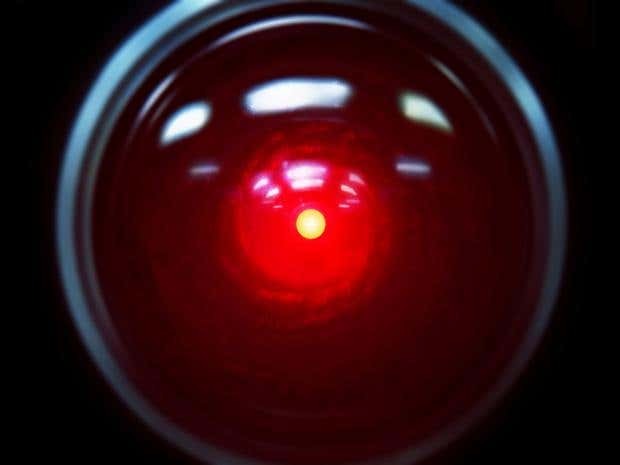 Created in Urbana, Illinois in the year 1997 (1992 in the movie), HAL is an artificial intelligence beyond anything created by man at the time. Hal is sent as part of a mission to Jupiter, as well as holding secrets the human crew are not to be privy to until they reach their destination. HAL then begins to subtle signs of malfunctioning, causing the humans on board to choose to shut HAL down. When HAL realizes this, he begins acting with self-perservation in mind. Though HAL seems to be emotionless, HAL has become self-aware and works to save himself. He has full control of the ship and is willing to use it to defend himself. HAL later appears in the novel and film sequel 2010, in which he helps the astronauts he meet uncover the mystery of what happened to Dave Bowman and eventually joins Dave as a god-like non-corporeal being. In the book 3001, the two re-emerge as a single entity named Halman. Trivia Incrementing each letter of "HAL" gives you "IBM". Writer Arthur C. Clarke claimed this was unintentional, and if he had noticed ahead of time, he would have changed it. I wish they would continue the Space Odyssey movie series as Arthur C Clark wrote 2 more after 2010.. The problem with 3001 is that Poole is the main character. Found floating in space frozen and revived early in the book. Gary Lockwood is now 81, do they use CGI motion capture, or find an actor that looks like the 30 year old Lockwood we last saw getting killed by HAL? Program Be a good boy. K9 is a robot dog who appeared in the TV series "Doctor Who" as well as in the spin-offs "The Sarah Jane Adventures" and the children's series "K9". Though most people think of K9 being the same character throughout, there have actually been multiple K9s. The Doctor met the original k9 in the year 5000 and the dog went on many adventures with him. When the Doctor's companion Leela decided to remain on the planet Gallifrey, K9 opted to stay with her. However, in the next adventure, the Doctor unpackaged another K9, who eventually ended up with the Doctor's companion Romana. A third one appeared in the pilot for a spin-off called K9 and Company (which is technically in continuity) and befriends Sarah Jane Smith. Decades later, K9 (now in disrepair) sacrifices himself to save the world, only to be replaced once more for Sarah Jane Smith. K9 is a good talking robo-dog with an incredibly powerful brain. He is actually smarter than the Doctor but lacks his wit and imagination. Nonetheless, his super-intelligence and laser nose have proven invaluable to the fourth Doctor through his adventures. K9 is also known to be sassy, often contradicting the Doctor. Despite his super-intelligence, he basically thinks like a dog and loves getting approval from humans. Trivia Writer and co-creator Dave Martin's own dog had also been recently run over by a car, and K9 was a car-proof tribute to it. Awww K-9 you good dog! Program Control the higher functions on the Satelite of Love. Gypsy is a robot in the long-running TV series "Mystery Science Theater 3000". Gypsy was created by Joel Robinson after he was trapped aboard the Satelite of Love and forced to watch terrible movies. Gypsy runs the higher functions of the ship and while very intelligent, much of her processing power was focused on the ship, making her personality that of a dull, cow-like creature. Over time, Gypsy has been able to assert more intelligence in her day to day life until she was largely thought of as the most intelligent and level-headed member of the crew. Gypsy is usually a fairly friendly robot, though she has been known to have foul moods. As the series went on, she proved herself to be a creative force, including creating and starring in a one woman show. Eventually she was freed from the Satelite of Love and went on to become very financially successful. For reasons unknown, she and the other bots were returned to the Satelite of Love in time to receive Jonah, the new test subject. Trivia Gypsy was named after a pet turtle Hodgson had as a child. I just realized an area of omission on my list, welp, I tend to forget MST3k counts when making lists for this site. But count they do, and surely my implied love is just as good as actually putting them on my list. Well almost as good. Okay maybe not quite as good. When it came time for me to put all the bots from MST3K on my list the only hard part was deciding how to rank them. The only omission from MST3K for me was... well, you'll know when you see my list. When that skit referred to bubble memory and Unix, I sensed its age! Gypsy was a borderline pick for me, but unfortunately was on the wrong the of the border. Her voice was always annoying to me. I liked the character but know I'm thinking about this way too hard. Vital Information Necessary CENTralized (or V.I.N.Cent) is a robot who appears in the film The Black Hole. He is a utility bot who works on the U.S.S. Palomino and detects the titular black hole. He and the crew end up boarding the U.S.S. Cygnus, a ship floating way to close to a black hole. V.I.N.Cent immediatey distrusts the crew of the Cygnus and his suspicions are confirmed when he discovers a robot named B.O.B. who tries to warn V.I.N.Cent about the ship's strange secrets. Soon V.I.N.Cent and the crew realize they must escape the Cygnus. V.I.N.Cent is a kind, polite and clever robot. He seems to be beloved by the crew and he, in turn, cares for them and is willing to risk his... I wanna say neck, for them as well. Similarly, Charlie Pizer nearly risked his life to save V.I.N.Cent before being ordered otherwise. Though seemingly harmless, V.I.N.Cent has a number of tools, as well as powerful lasers. Trivia The character of V.I.N.CENT. was originally to have more elaborate electronic eyes (based on electronic stock ticker-type billboards), which would have given him a greater range of facial expressions. Unfortunately, the electro-mechanical eyes simply didn't work properly and the effect was abandoned at the beginning of principal photography.